enny Dreadful Sir Malcolm 6-Inch Figure - Convention Excl. Entertainment Earth Convention Exclusive! As an amasser of rare souvenirs acquired on his travels, Sir Malcolm Murray knows a valuable collectible when he sees one. Now Dreadful fans the world over can collect the collector himself with the Penny Dreadful Sir Malcolm Murray 6-Inch Action Figure – Convention Exclusive from Bif Bang Pow!. This intricately detailed figure features the debonair explorer in a dapper black tailcoat suit made of soft and bendable PVC plastic. The rest of Sir Malcolm’s ensemble is completed by his white collared shirt, black tie, and vest. 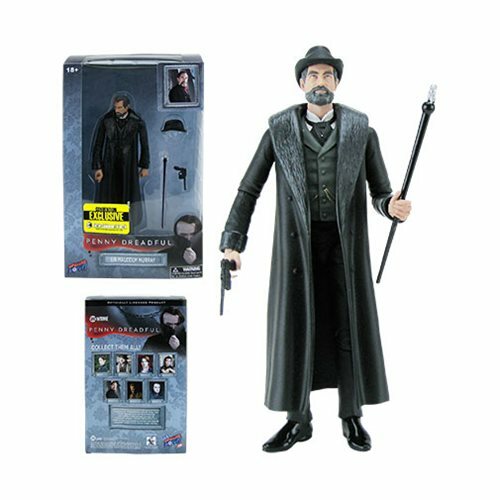 This first ever 6-inch figure of the popular Penny Dreadful character features a whopping 18 points of articulation and includes Malcolm’s signature cane with sitting lion, removable hat and hand gun as accessories. With a production run of only 2,800 pieces, this individually numbered and limited edition Entertainment Earth convention exclusive will disappear scary fast! Ages 18 and up.